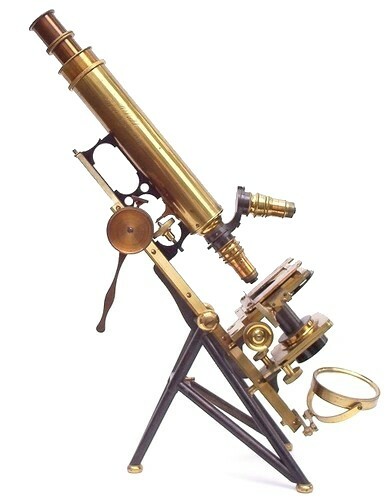 Adjustments of both the coarse focusing of the tube and the mechanical stage of this microscope utilize a fusee chain mechanism. Among the accessories are three objectives signed by Ladd and one is dated 1865. 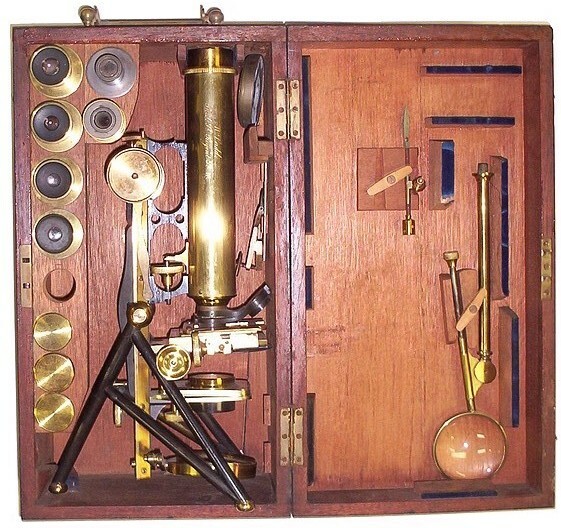 Ladd's Student's Microscope. This instrument (fig. 34), kindly presented to the Society's Collection by Mr. Wynne E. Baxter, was exhibited at the Meeting on May 18, 1904. It was made about 1864. 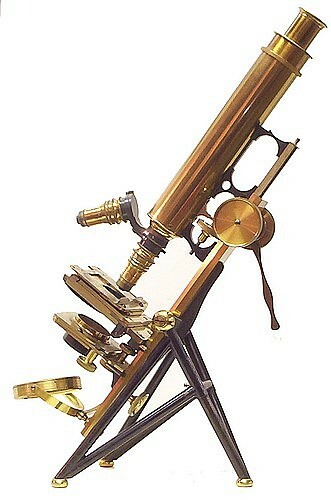 Its features are: a very light tripod foot, consisting of a framework of tubes; a body fixed on a frame, which slides on a straight dove-tail bar, on the Jackson plan; the substage slides on the same bar, and is movable by rack-and-pinion, whilst the stage, which is also fitted in the same dove-tailed groove, is fixed. Motion is not imparted to the body by rack-work, but by a chain working round a spindle turned by the milled head, which gives a movement of remarkable smoothness and free from backlash. A part of the chain is visible in the figure, above the top of the dove-tailed bar. 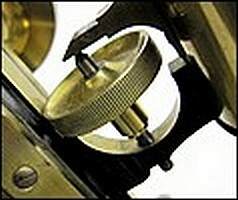 The fine-adjustment is made by a lever, which hangs down from a collar formed on the right-hand milled head of the coarse-adjustment. The mechanical stage is also moved by chains in both directions. The substage referred to is peculiar, and consists of two movable plates carried by a third plate which is fixed to a bracket that slides in the dove-tailed groove already mentioned. The centering of the substage is effected by means of the two movable plates. The upper plate is pivoted on the lower, and the latter is pivoted on the fixed plate. 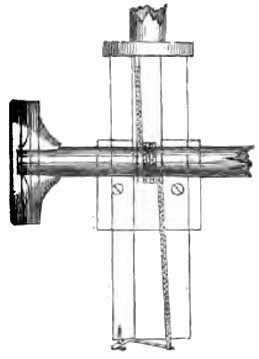 The pivot of the upper plate is seen in the figure, to the right of the tube for receiving the condenser. The pivot of the lower plate is to the front of the tube, and is hidden by the upper plate. Motion is given to each plate by means of a pinion geared into a short rack cut in the edge of the plate near the corner. The pinion and milled head for moving the lower plate are seen in the figure, and the pinion for moving the upper plate is in a corresponding position on the other side. 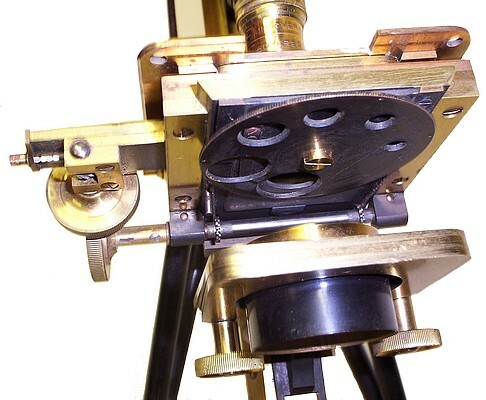 Owing to the positions of the pivots, the movements of the plates are at right angles to one another, so that the condenser can be adjusted to the axis of the instrument. 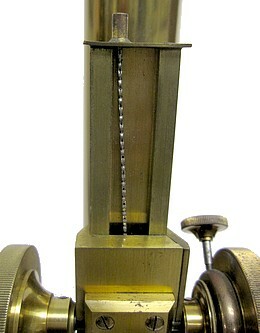 The mechanical stage is moved in both directions by chains passing round spindles. There are two eye-pieces and two object-glasses, of 1 in. and I in. focus. 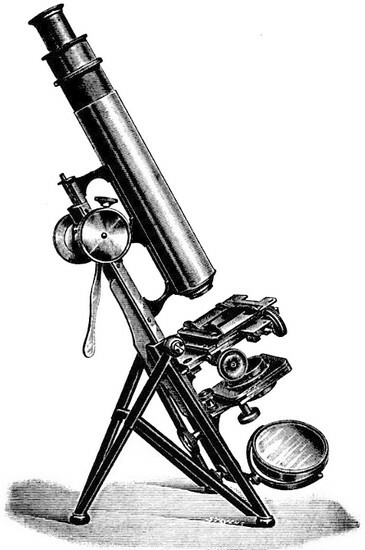 This Microscope is described in Carpenter, 4th edition, 1864. More information is available in the 1861 W. Ladd Catalog. Note that the example in this collection has a fine adjustment mechanism utilizing a micrometer screw operatng on the nosepiece.